We’re about to witness the greatest transfer of wealth in history. Over the next 30 years, baby boomers will pass $30 trillion in assets to their Generation X and millennial children, and most of these young investors plan on firing their parents’ advisor. Anyone born between 1980 to 1997 falls into this category, and their experience plays a significant part in how they invest. What sort of financial crises have they seen in their lifetimes? A lot. With all this volatility, it’s no wonder young investors manage their portfolios with fear and urgency, if they decide to invest in the first place. After all, losing 40% of your investments every 4-7 years (or watching your parents lose theirs) can wreak havoc on your ability to make rational financial decisions. 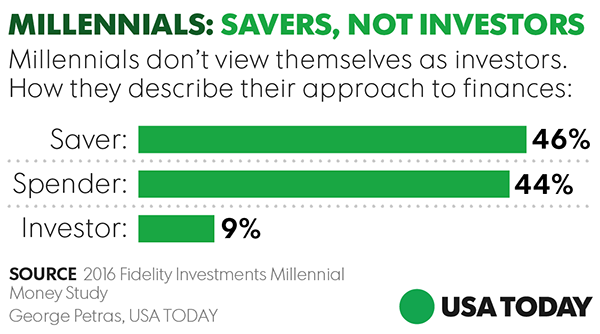 Instead of investing, millennials are saving their money to avoid taking a hard loss in the market, and a recent study by Fidelity backs up these claims. How can advisors overcome these unique challenges - and why should they? 1. Quit stereotyping young investors. The days of stereotyping young investors into the aggressive, high-risk category are over. Sure, young investors have a head start where they can make back market losses - but is that how much risk they want to take on? Is that how much risk they need to reach their goals? The answer is maybe. A team of academics assessed Riskalyze’s research and methodology and found that 52% of 20-29-year-olds don’t fit their “aggressive” stereotype. That means if we blindly invest them aggressively, we’d be doing so outside the client’s risk tolerance more than half the time. Investors are individuals with unique goals. How far can this investor’s portfolio fall within a fixed period of time before they’ll capitulate and make an emotionally-charged, poor decision when it comes to their investments? If you don’t know what they’re willing to risk in the short-term, how will you convince them to stay at the first sign of trouble? Let’s start treating this generation as the individuals they are. 2. Set expectations and reinforce them continually. Advisors wear plenty of hats, but you’re likely familiar with the role of “client ledge-talker” when it comes to times of market volatility, especially with inexperienced investors. In down markets, risk-averse clients are panicking about losses, and when markets are booming, others are asking, “why is the market beating my portfolio?” It’s enough to drive great advisors insane. Focusing on long-term goals may be the best ultimate practice, but millennials aren’t going to simply ignore every investing statement they receive until they retire. We’ve found that emotional reactions to risk are the number one killers of long-term financial plans, and that’s why advisors love using Riskalyze’s six-month, 95% probability range to powerfully set and meet expectations. It’s important to remember that long-term investors are made one short-term decision at a time. These days, many millennials judge a business’ credibility on their consumer-facing tech. Whether that sounds scary, or like a great opportunity, sharpening the investor-facing technology experience is a no-brainer investment when it comes to winning younger investors. Client-facing technology isn’t optional when it comes to working with young clients. Research shows that young investors expect their human advisor to have all the tools that the robos have. Hearing their advisor say “trust me” just won’t cut it. Why tell them when you can show them? Back-office technology frees you up to maximize your time coaching clients and accomplishing all of the above. Make sure you’ve got the right tools in your arsenal to automate manual processes and focus on what you do best. With fintech that’s well-designed and easy to understand, you can show prospects they’re invested wrong, and prove to clients they’re invested right. Speak the language of young investors, and keep them around for the long haul. New investors are especially susceptible to the emotional pitfalls of the investing, which makes their behavioral coach (you) their most important resource. With the right advice, experience, and tools - a young investor can be a fearless one!